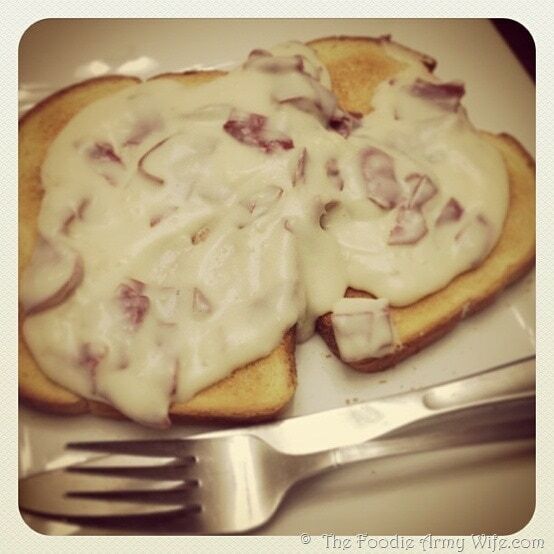 Classic chipped beef served on toast – one of my favorite lunches when I was a kid. Who knew there was such an adoration for the classic and simple dish? Now some people refer to it as “creamed beef” or even “S.o.S.” ( ____ on a Shingle) – but I grew up calling it Chipped Beef. The SOS term often refers to the staple dish served in mess halls/chow halls at military installations all over. Normally that is made with ground beef rather than the dried beef I use here. Whatever you call it, or however you like it – here’s one of my favorite childhood weekend lunches. To begin, rough chop a 4 ounce package of dried beef. Place it in a small colander or sieve and rinse under cold water. Set aside for now. In a saucepan, melt 5 tablespoons of unsalted butter. Whisk in 1/2 cup of all-purpose flour. Let it bubble for just a minute. Pour in 4 cups of milk while whisking. Stirring continually, cook over medium heat until it comes to a gentle boil and thickens into a beautiful gravy. Add in 1/2 teaspoon of freshly ground black pepper. Add in the dried beef and stir. Let it cook for just a minute, to heat the beef through. Serve on toast. Or, if you want to go that route…you could serve this on biscuits as well. I grew up eating it on toast so that is the only way I serve it in my house. To begin, dried beef is highly salted, and you really don’t want all of that in your food. Rough chop the beef then set it in a small colander or sieve. Rinse under cold water. Set aside for now. In a large saucepan, melt the butter over medium heat. Whisk in the flour, and cook for a minute until the mixture bubbles. Whisk in the milk, and heat this while continually stirring, until it comes to a boil and is nice and thick. Remove it from heat, and stir in the black pepper and then stir in the chopped dried beef. My dad loved this when he was in the Army and my mom would make it for him. Although we had a little different name for it lol. I love this. I add a pinch of dried minced onion for a little extra flavor. I lived on this in college! Where we grew up, this was called S**t on a Shingle and my Mom would make it with cream of celery soup and hamburger. Absolutely awesome comfort food! Yum! I'll have to remember that one. Sometimes I forget the sheer comfort some thing simple can bring. I used to make this a lot . I forgot about it until I just saw it here. We always liked it and, I don't know why Iforgot it. Thanks for reminding me. My mom didn't make this but I had a room mate after college that made it for me. She paired it with creamed peas! Oh! My! Goodness! One of my absolute favorites. My mother used to make this as her 'I've run out of time, and everyone is hungry' standard. I love it. Thanks for posting this.